Time: Around 2 or 3pm when I finally started fishing. Weather: Sunny to partly cloudy and cold. # of fish caught: Don't remember. It was a cold pre-summer morning. I’d chosen an overlook outside of Yosemite to bivy in my Rav4 that morning. 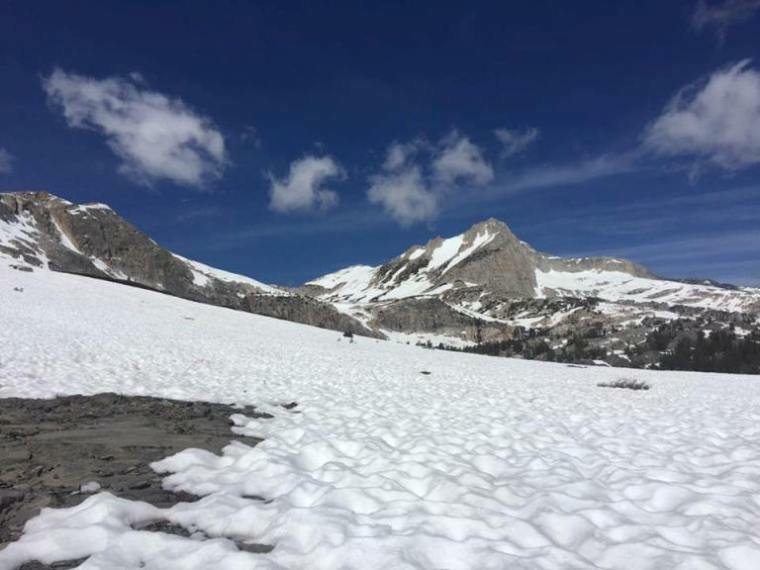 There are many such bivy spots between Tioga Pass and Lee Vining if you know where to look. Sure, it’s not a real bivy but an impromptu camp site. Sleeping in your car? The terms seems to fit. My new Rav 4 hybrid is not ideal for this sort of thing. Not that the corolla ever was but with a Rav 4, you’d expect more space. On a previous trip I’d tried sleeping 4 hours in the passenger seat and 4 hours in the rear seat. Both were uncomfortable and worse than sleeping in the Corolla. Near it’s end, I’d found that a really firm thermarest, not the new space aged mylar types but the ancient green and brown cardboard type, was perfect for a good night sleep in the passenger seat of the Corolla. Not so with the hybrid Rav4. So when I rolled into the bivy spot a 3am, I decided to fold down the back seats and try to sleep in the back. Unlike my wife’s 2010 Rav 4, the rear seats of the hybrid version don’t fold flat. In addition, there’s a slight drop to a flat rear boot, accounting for the rear motor and hybrid battery. Lying there at about a 30 degree angle it was surprisingly comfortable. I situated myself and then rolled down to the Lee Vining Mobile station for some breakfast. With Saddlebag resort closed, for sale and perhaps never to open again, I had to find a new breakfast spot when fishing Saddlebag Lake. I rolled into the Saddlebag Lake resort without giving too much thought to the conditions. I knew there would be snow. 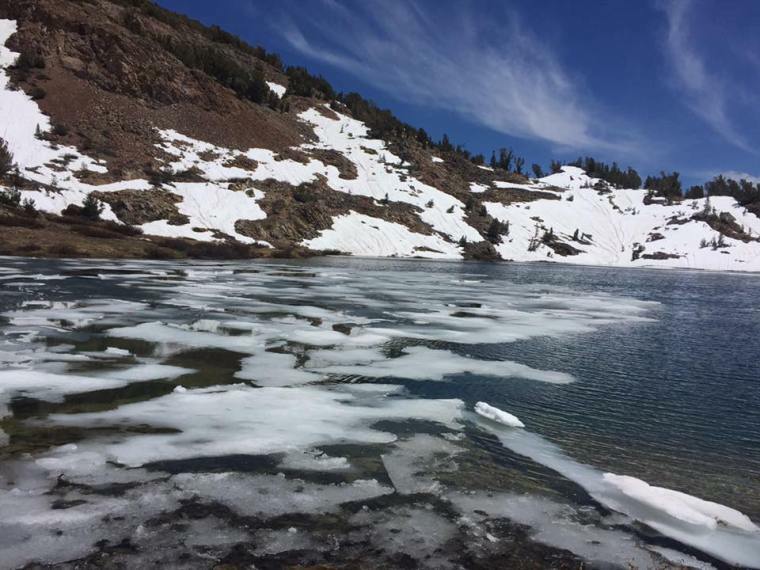 I knew that I’d left my snow shoes in Roger’s car over Memorial Day but figured I’d still find a way up to Conness Lakes. I’d never not been able to make the lakes once I decided to hit the trail. There was snow but it didn’t look terrible so I decided to give it try. From the parking lot, you can’t see how much snow is actually in the 20 Lakes Basin proper. The trail and the basin are hidden by a bluff as the lake curves north and west. I wasn’t initially deterred by the snow that I saw on the western trail around the lake. I always choose this trail as it’s the closest to the Conness Lakes. The eastern trail however was clear of snow for almost its entire length and would have been the better choice, if I could have actually accessed the lake; but, I could not. 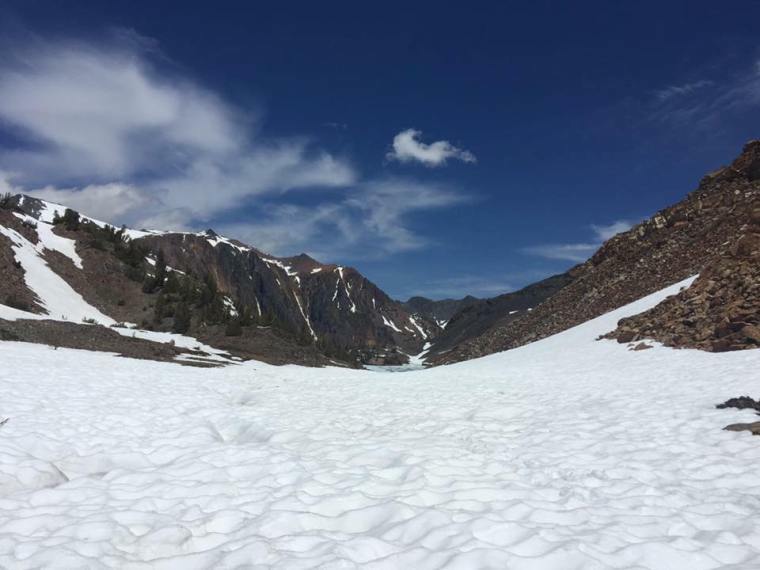 The basin around Greenstone Lake and the granite up to Conness Lakes was snowed in. I trudged through the snow to the outlet of Greenstone. The snow was soft and deep. Sometimes hard crusty snow collapsed, making travel difficult and dangerous. It was up to my waist in spots and travel without snow shoes would be an effort in futility. I made a couple of casts into Greenstone Creek but decided to head to Odell Lake since there seemed to be much less snow on the eastern portion of the basin. For the most part, the eastern portion of the basin did have less snow but there were those areas around lakes, over creeks and beneath the shadows were the snow was very deep. It was reasonable going until I reached the downhill into Odell Lake. It was one vast ocean of waist and deeper snow. Sometime crusty, most of the time wet and slushy but always hiding that narrow deep shoot that I know leads to Odell. In addition, most of the lake was still covered in ice. Not wanting to fall through a crust of snow into a deep crevasse nor wanting to wade through slush, I decided to detour to some lakes above Odell. After all, this is the Twenty Lakes Basin. I’ve fished 14 or 15 of these lakes. Having alternatives is always one of the reasons to fish this basin. 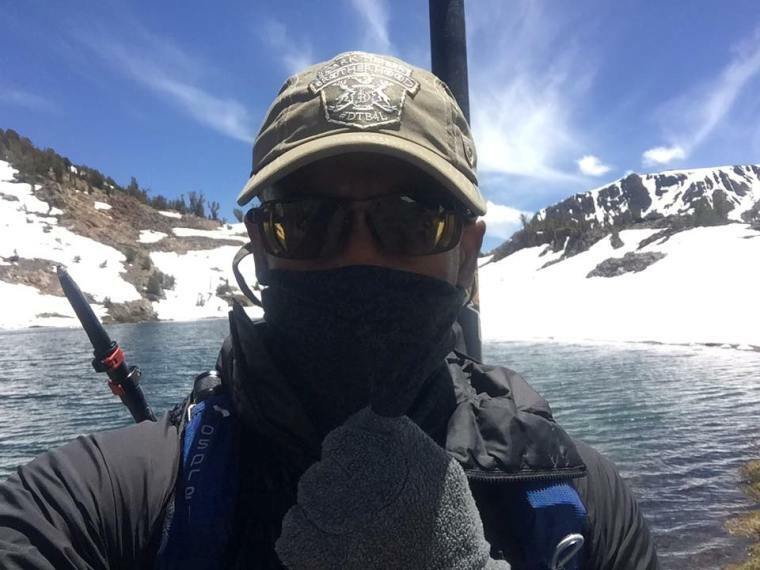 It was a three or four hundred feet climb to a point that would allow me to descend into the lakes but the terrain up was predicated with many peaks and valleys full of snow. I switchbacked my way up to avoid the deep snow. Sometimes scrambling up steep rock faces, sometime traversing laterally only to do it again. At the top the wind was howling, nearly blowing me over. From the peak I could see that the lake itself was free of ice; unfortunately, the snow was too deep so I made a 3rd change of plan and headed to Hummingbird Lake. I'd passed Hummingbird on the way in. Small, with a bit of ice near the outlet. I'd remembered it as a small brook trout lake. The other 3 lakes were Golden Trout lakes. By the time I reached Hummingbird I'd been hiking for 5 hours through snow, over ridges, up to peaks. The hike to Hummingbird in contrast is a relatively flattish hike from Saddlebag Lake and most easily accessed from the eastern trail. It's a small lake, which in my mind makes a good fishing lake. It's easy to cover the entire bank during a reasonable day of fishing. Much of the bank still had snow covering it, with a snow shelf or two jutting out into the lake. In addition the northern portion of the lake still had floating platforms of ice. I made a few prospecting casts at the outlet and to a few more to the ice shelves near the outlet before walking the bank. I could see water running into the lake. It seemed more like run off than a proper inlet but I decided to check it out. It was cold, I was getting colder. On the opposite side of the lake, just down the bank from the inlet I saw my first fish. It ducked under an ice shelf and was out of reach. Not because I spooked it; but, because it was moseying in that direction. The inlet flowed through some low bushes before feeding the lake. My 3rd cast was taken confidently and I landed my first fish. Not the tiny, stunted Brook Trout that I remembered living here but a nice robust trout of about 10 inches. Several casts into and around the incoming current were rewarded with several fish of similar size between 10 and 13 inches. I moved down the bank a bit, catching fish as I went but none were of the same quality as those around the inlet. In late afternoon clouds rolled in and shaded the lake, dropping the temperatures. Feet cold from the snow and hands cold from the water and fish, I decided to call it a day. I hiked back along the eastern trail happy to have gotten out and looking forward to better fishing the next day. Here's a quick little experiment. My wife has been encouraging me to make some videos. Nothing professional but fun and a way for me to take her / show her places she'll never trail to herself.